There is so much information out there about Google PPC ads, it’ll make your head spin. Especially if you’re not technically inclined. Or if your eyes start to glaze over when you hear terms like CTR and negative keywords. The good news is that a lot of that info is not meant for you; a small business owner. It’s geared towards SEO professionals and companies that have huge PPC budgets and massive campaigns. So, of course you feel overwhelmed (or like you’re reading Sanskrit) when you see some of these online articles! Large PPC operations are complicated, and given the dollars involved, need to be scrutinized religiously. Small business owners, with their little budgets and fairly simple communications goals have it much easier in getting PPC going. While it’s not going to be as complicated for a small business, you still have to follow some basic rules to make sure that you don’t waste any of your hard earned money. 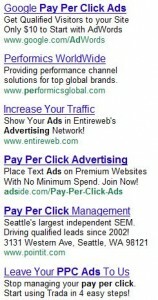 If you’re new to PPC or have a limited budget, don’t bother with the display network. It involves a whole different type of strategy and does not target people who are actively seeking your service. Just concentrate on the search. This one seems pretty basic, but this is where a lot of the PPC horror stories come from. You cannot accidentally spend thousands of dollars if you have a set budget. Period. You can pick exactly who to show your ads to and this is another important way of setting up your campaign properly, to save costs and reach only your target audience. You can get right down to city level, so make your choices wisely. If you’re a local small business, be sure to include your city/location in your ad. This will help to draw a local searcher’s attention. Encourage searchers to do something. Whether it’s call you. Contact you. Get a free estimate. What is it that you want potential customers to do? Great, now ask them to do it. Trying to jam in everything you do in a tiny ad space is not going to work. Don’t just list off all of your services. Focus on one at a time, and create a compelling message around that topic. If your ad title matches the search query, it will be much more visible and tells the searcher that your business is relevant to what they want. This is another very common mistake I see. Small businesses using a whole bunch of different keywords as the titles for their ads, but their copy has nothing to do with the title. Can you see how in the example, the body of the ad does not match the title? For this reason, one campaign should only be about one particular type of service. The page that you send clickers to must without any doubt match what it is you are advertising. In most cases, the homepage is not the best place. If you are advertising a product or a service, link directly to that page in your website. A conversion is what you want people to do on your website. It might be to reach the contact page. Or fill out the contact form. Or enter in their email. Your goal is getting them to that page in your website, and it’s important to track so that you can see if your PPC ads are working effectively. This you can do easily through your Google Analytics. When you are in Adwords click on “Reporting and Tools” and go to “Analytics”. Click the “I already have an Analytics account” and go to the next step. Make sure to do this before your campaign starts, not after. Analytics does not go back in time to track things. There are so many different variables in PPC advertising that it’s easy to get overwhelmed, or worried about whether you’re doing it right. Start small and remember that changes and adjustments are only a click away. You just have to monitor things carefully and figure out over time what will work best for your biz. These are some of my top PPC tips. Do you have any to add? Any experiences with using PPC ads effectively for your small business? Thanks for the comment Janet! Glad you found the steps useful. PPC can be confusing, so small businesses must focus on keeping it simple and getting the little things right. While I agree that you should track conversions in Analytics, I believe that even the smallest business should also install the AdWords conversion tracking code. That’s good advice Robert! The more information you can track, the better informed you will be about what’s working and what isn’t. Here is the link to the instructions for getting the Adwords conversion tracking code set up on your website . You will need to have access to the backend of your website, or get your web team to do it for you.